GET WRAPPED UP IN WIRE WORKING ! Class Dates, Schedules etc. are Located on the Jewelry Class Calendar Page. Private and Small Group Classes are Available. Please go to the Private Classes page for more information. 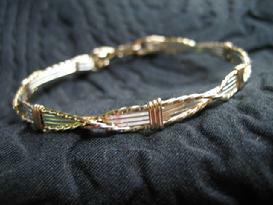 This Braided Bead Bangle Class will teach you how to make wraps with 1/2 round wire. The hook and eye clasp is incorporated right into the bracelet. Previous wire wrapping experience is recommended by not required. Multi colored beads makes this bracelet fun to make and can be worn with many items in your wardrobe! Date: Please see Jewelry Class Calendar Page. Suppplies: (36 inches) 20 gauge round 1/2 hard or dead- soft wire. (6 inches) 20 gauge half-round half-hard wire. 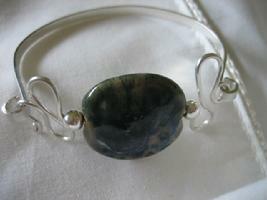 The Squiggle Bracelet is a great introduction to wire wrapping. No experience required! 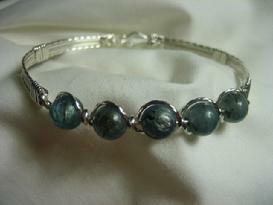 Choose a focal bead add some end caps, work the wire design, your beautiful bracelet is ready to wear! Supplies: (6 inches) 1mm x 3 mm Sterling Silver Rod. (12") 16 g SS wire. One focal bead, 2 bead caps of your choice. The Geometric Bangle Class is an an advanced wire working class (previous wire working experience suggested). This class will teach students how to combine twisted wire, square wire, round and rectangle beads to make a beautiful bangle bracelet. Supplies: (20 In.) 20 ga sq wire 1/2 hard. (18 in) 20 ga sq wire dead soft. (9 in) 20 ga round wire 1/2 hard. (30 in) 20 ga 1/2 round wire 1/2 hard. Rectangular beads 4 x 4 x 13mm. (14) 3 mm round silver or gold beads. Criss-Cross Two Toned Bangle Bracelet: Twisted gold square wire is criss-crossed over sterling silver wire to create this beautiful two toned bracelet. Wire wraps are created in gold to complete the gold and silver design. Basic wire working knowledge is necessary. Supplies: Soft Square Wire 20 g (Silver) 20 Inches. Half-Hard Square Wire 20g (Gold) 30 inches (includes clasp). Half-Hard, Half -Round Wire 20 g (Silver) 18 inches. Five Bead Bangle Bracelet: Five sparkling 8MM Swarvoski Crystals or 8 MM round beads of your choice, combined with twisted silver wire makes a stunning bracelet. Advance your wire working skills by learning to twist square wire and wrap it to create a focal point of beads on a solid bangle bracelet. Previous wire working experience is necessary as students must know how to wrap a bundle and twist square wire. Five - 8 MM Round or Faceted Round Beads (beads must fit onto 20 gauge wire). Viking Knit Bracelet: (4 hours instruction). Using just a hex wrench, draw plate and wire, learn how to knit this beautiful bracelet. We will be adding cone ends, bracelet clasp, and adding a patina with LOS if desired. Supplies: 3 feet 20 gauge craft or copper wire, 5 yards 26 gauge dead soft sterling round wire (the amount of wire needed will change according to finished size of bracelet). 2 feet 24 gauge dead soft copper wire. 2 Cones with 1/4 inch opening, 1 1/2 feet -of 20 gauge sterling 1/2 hard round wire. 1 Small lampworked or gemstone bead. 2 end caps for bead. Class Information: Please see Jewelry Class Calendar Page.